Town house with 2/3 bedrooms and 2 shower rooms, a 50m² private courtyard and a 100m² . . . This charming detached 3 bedroomed property, with possibility to have a downstairs bedroom if . . . This detached property, comprising two houses, a good sized barn, semi renovated to . . .
Another charming country property for your consideration. This 3 bedroomed house with large . . .
Great opportunity to realise the potential of this property that has been started by the . . . Traditional farmhouse reached via the private gated drive, set in grounds of nearly 2 acres . . . Located in a quiet hamlet this well presented house has efficient heat pumps providing air . 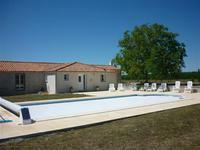 . .
Renovated 4 bed stone bungalow with pool on a large plot in the country, 25kms from the beach and 5kms from Luçon. The bungalow with about 180m² of living space, has been totally and very well renovated and . . . This is a wonderfully renovated country 4 bedroomed house with its separate 3 bedroom gite . . .